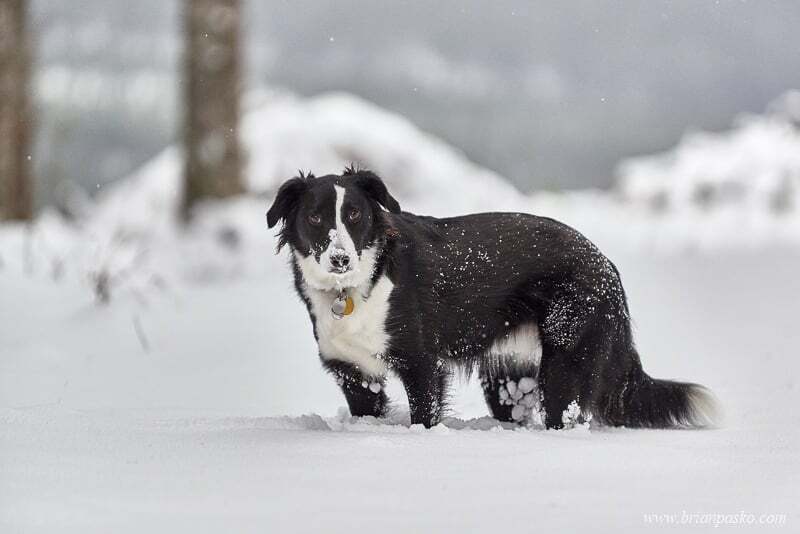 I am often asked by pet owners how to photograph their back dogs, especially in white snow or other bright conditions. They find that their cameras will often capture the scene reasonably well, but their dogs appear as black blobs with little or no detail. 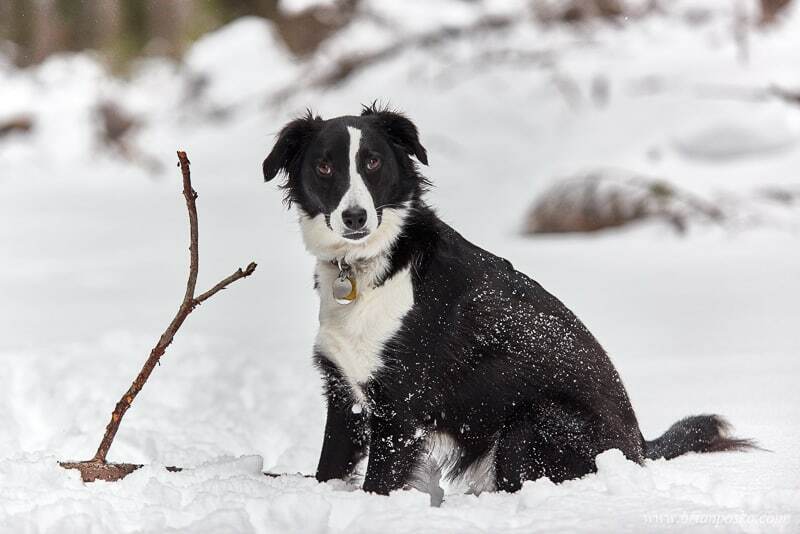 I am the proud owner of a black and white border collie rescue dog. 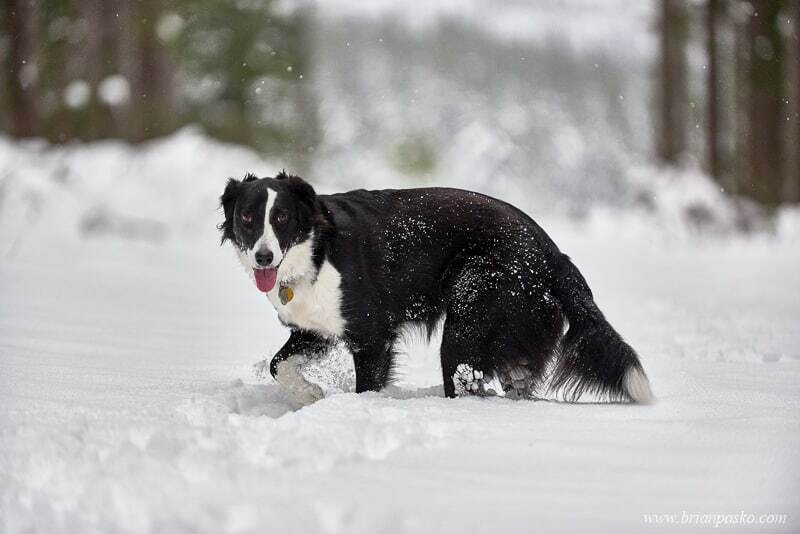 She’s still a puppy, and this winter was her first experience romping in the snow. The images in this post were taken during a walk we took on a remote logging road in Oregon’s Mount Hood National Forest. The answer in conditions like these is usually not to buy a “nicer” or more expensive camera. Instead, take advantage of the manual modes that are even available on your iPhone camera. 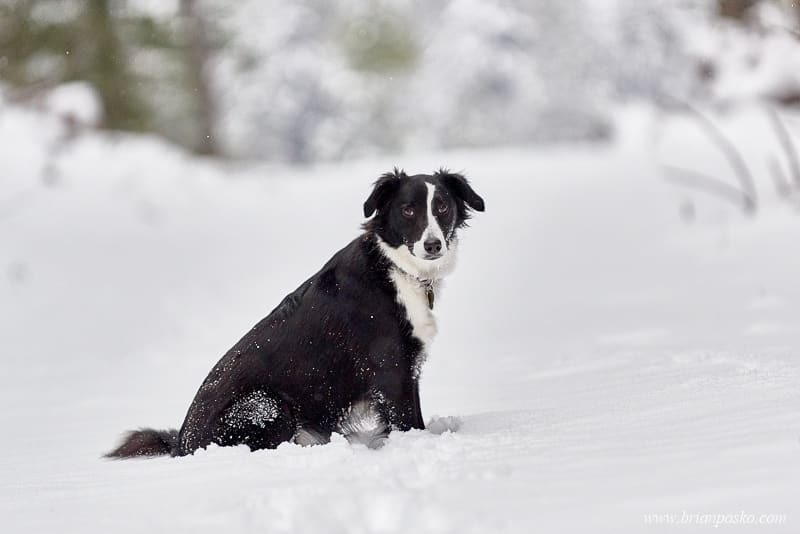 Even for modern DSLR camera meters, bright white snow and black dogs can be tricky. These scenes, which have what is called “high dynamic range,” which easily fools the built-in meter in your camera. High dynamic range is the measure of the light intensity between the brightest whites and darkest blacks in your scene. The wider the gap, the harder it is for your camera’s meter to choose the correct exposure for your image. Because the snow is the dominant element in the scene, using your camera’s auto mode will almost always result in underexposed images. The camera’s meter sees the bright snow and tries to balance that by darkening down the scene. 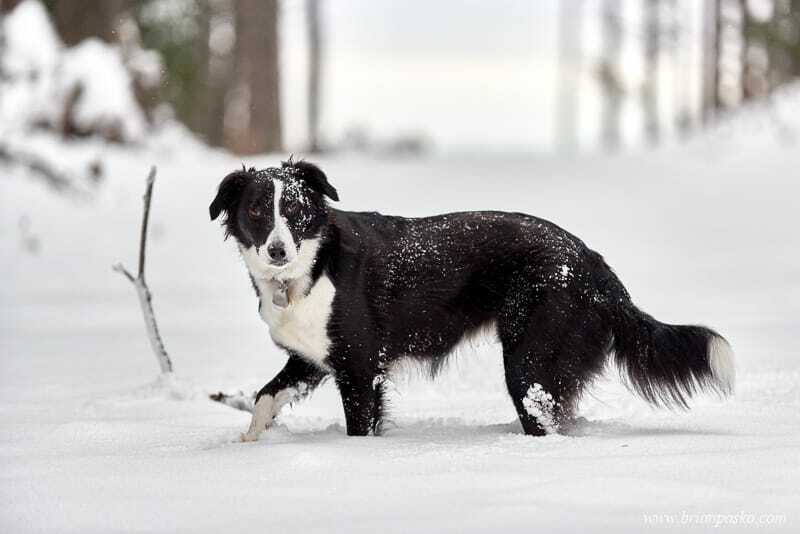 Thus, the final image has muddy gray snow and a dog that looks like a black silhouette. Conversely, when your black dog is the dominant element in the scene, your camera will do the opposite. The result will be an image that is too bright without proper contrast on your dog. To compensate for this, take advantage of your camera’s manual mode. If you don’t know how to do this, your camera’s manual is the best place to begin learning. In snowy conditions, you want to force your camera to brighten the image. This is often done by decreasing the camera’s shutter speed just enough to brighten the scene without introducing motion blur to the photograph. There are other options too, depending on your camera’s model and capabilities. One last piece of advice. Don’t delete your images until you get them home and have an opportunity to view them in a dark room. Bright conditions also affect both the LCD screen on your camera and your eyes. Images that look horrible outdoors, might look completely different in a dark environment. Do you want beautiful portraits of your black dog or other pet that capture your pet’s personality? Click here to learn more about pet portraits with Brian Pasko Photography!